Being both a performing musician and a music educator, I often reflect on the relationship between these two parts of my musical being, and on the ways that learning to communicate as a musician with audiences has influenced my way of communicating with music students. More and more I feel that communicating musically from the stage is so similar to communicating about music with a student who is actively counting on me to be a guide on their journey of exploration and discovery of how to play an instrument. But in the case of Music Together classes, these parallel experiences have the unique chance to simply blend into one, seemlessly. Thanks to the inherent open-mindedness of the particular age group we serve, Music Together classes present us with the opportunity to achieve our educational goals primarily by getting in touch with our own inner musician, leading and sharing songs with others in an authentically personal way. Usually when we are teaching older students, we have to always pause to take into account the need for development of technical skills like fingerings, scales, counting, and the like, and depart from "the jam". But in Music Together classes, the entire class time is meant to be one continuous groove, with the teacher as the bandleader. We guide the band through changes like when to get softer, when to get louder, when to harmonize, when to speed up, slow down, clap or stomp the beat, pause, hold an accompanying pattern, or when to change the lyrics or the overall vibe of the verse we're doing together. Lo and behold, these are the same things I find myself doing as a bandleader on stage! The only difference is that in a band, we are aiming to communicate something through music to the audience, while in a Music Together class, the "band" that comprises the class is simply in a musical conversation with itself, including the little kiddos who may or may not be able to be "active" band members yet! Because even if they aren't singing or clapping along yet, they know and sense that they are already "in the band", thanks to mom or dad or grandma or grandpa or nanny or whoever just showing up to the jam WITH them! For a teacher, getting into a good internal groove, musically speaking, is immediately contagious to the class. It's the same for musicians performing on a stage. When we are focused, enjoying the feeling of the music we're making, it carries our band mates along to an ever more cohesive jam, and this in turn palpably affects the audience. In Music Together class, when parents join in, un-self-conciously, to explore the wealth of textures and corresponding sounds and movements that are available to us through the songs and song activities, the class becomes one big expressive jam session, where adults and children alike get carried along by rhythm and melody, the fun and the mystery that the music explores. The teacher is there as just another member of the band, inviting the rest of the group to get in a groove so that we can all share in giving our children the joy and the depth of such a special, multi-faceted and infinitely human experience of MAKING music together. Every single moment, we can be sure that countless families are singing and dancing together all over the world. Why is that? Is it because music and dance are among the most enjoyable activities that a human can participate in? In part, the answer is obviously yes, but it's also because of the meaning these activities bring to us as individuals, as well as to our families and our communities. Having traveled to over a dozen countries in search of opportunities to share music with people from different musical traditions, I've had the chance to feel the diverse ways that social music-making is experienced in different parts of the world. I'm always curious to ask people how those traditions are changing in their countries, and not always surprised when people talk about how "we used to…" or "my grandmother always…" when relating these experiences. However, in comparison to my experience in the United States, almost all other countries I've visited enjoy a more robust, active tradition of people signing together in social gatherings. Of course, in certain parts of the USA, and among certain specific communities here, this is not the case. In general however, people's unconscious confidence about their ability to sing, and their conscious awareness of the wealth of songs in their collective memory is generally much higher in Latin America and Europe than it is in the USA, for example. Obviously this is partially a result of the fact that the USA is a younger country, and we aren't often singing many of the songs of the countries we came from 5-10 generations ago, even if we might be singing folkloric adaptations of those songs (in Music Together class for instance)! If our grandparents or parents were raised outside of the USA, perhaps we do know tunes in other languages, and hopefully share that wealth of music with our own children and communities here in this country. But outside of relatively more recently-arrived immigrant populations and affinity groups (whether religious or cultural) it seems that in the United States in general, there are precious few moments that we find ourselves sharing in song and dance with members of other generations, with the music coming from our own mouths and instruments. And since singing and dancing together are some of the most enjoyable and meaningful experiences humans can have, the lack of opportunities to share in the human tradition of social music-making in this country can leave our children, our families, and our communities at a real disadvantage. During a recent Music Together class that I gave, I had a special moment that engrained itself in my memory. We were sitting in a circle, playing a patty-cake game while singing a song, and several of the children found themselves sitting or crawling on the floor inside the circle of parents. At a certain point, we were all holding hands high in the air and swaying back and forth while singing with reckless abandon, and all of a sudden, all the kids inside the circle looked up, mostly with open mouths, and froze for almost an entire minute while taking in the scene for as long as it lasted. In that moment, I saw in their faces that they were seeing something they hadn't seen ever before: a group of adults engaged in a perfectly choreographed musical movement, enjoying ourselves regardless of what our children were doing. The distinguishing feature of this moment for the children was that the parents were truly engrossed in doing something fun, but exactly in tandem with a group of other adults. Although we weren't on our feet, essentially we were in the midst of a dance, and every single child in the circle took note of the fact that we were so perfectly in sync. It might not sound like much, but for children who, outside of Music Together class, have probably never seen their parents singing and dancing with other adults, it was obviously a deeply intriguing moment for these kiddos. We kept singing and swaying in tandem, and I felt the connection between the kind of spontaneous song-singing and dancing I've experienced so often outside of the USA, and the real reason we are doing what we do in Music Together class: The parents were really having a ball together, and the children were learning something, perhaps new, about what humans (adults) do together in the world. Although these children had been coming to class and participating in musical games and dance activities, it was the tight circle we were in that meant that their entire field of vision (and hearing) was filled with a music-making group that included their "most important people"- their parents. They noticed, they were intrigued, and they were moved, just as I was. If they are lucky enough to regularly experience this kind of social music-making, as humans have through history, who knows the depth of the meaning it might have in their lives and in their communities? At the same time, however, for families that share these kinds of experiences together on a regular basis, the meaning experienced within the family itself is immediately palpable. Anyone who has ever played in an orchestra will be familiar with the phenomenon: the impulse for one's own actions does not seem to come from one's own mind alone, but rather seems to be controlled by the coordinated activity of the group. And indeed, interbrain networks do emerge when making music together -- this has now been demonstrated by scientists from the Max Planck Institute for Human Development in Berlin. 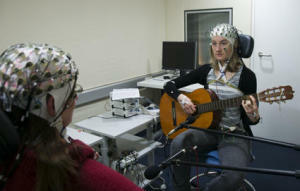 The scientists used electrodes to trace the brain waves of guitarists playing in duets. They also observed substantial differences in the musicians' brain activity, depending upon whether musicians were leading or following their companion. To test this hypothesis, the psychologists assigned 32 experienced guitarists to 16 duet pairs and attached 64 electrodes to each of the musicians' heads. This enabled the scientists to record the activity of the brain waves over different regions across the entire head. Then, the musicians were asked to play a rondo sequence from the Sonata in G major by Christian Gottlieb Scheidler a total of 60 times. Importantly, the two duet partners were given slightly different tasks: They had to play in two voices, and one of the two was assigned a leading role, ensuring that they both started at the same time and were keeping the same tempo. The difference between leader and follower was reflected in the electrical activity captured by the electrodes: "In the player taking the lead, synchronization of brain waves measured at a single electrode was stronger, and already present before to the duet started to play," says Johanna Sänger, the first author of the study. This was particularly true for delta waves, which are located in the frequency range below four Hertz. "This could be a reflection of the leading player's decision to begin playing," Sänger thinks. The scientists also analysed the coherence between the signals from different electrodes attached to the duets' heads. The result was remarkable: When the musicians had to actively coordinate their playing, that is especially at the beginning of a sequence, the signals from frontal and central electrodes were clearly associated -- not only within the head of one player, but also between the heads of the duet partners. "When people coordinate actions with one another, small networks within the brain and, remarkably, between the brains are formed, especially when the activities need to be precisely aligned in time, for example at the joint play onset of a piece," says Johanna Sänger. The current data thus indicate that interbrain networks connect areas of both brains that previously have been associated with social cognition and music production. And such interbrain networks are expected to occur not only while performing music. "We assume that different people's brain waves also synchronise when people mutually coordinate their actions in other ways, such as during sport, or when they communicate with one another," Sänger says. The above story is reprinted from materials provided by Max-Planck-Gesellschaft. 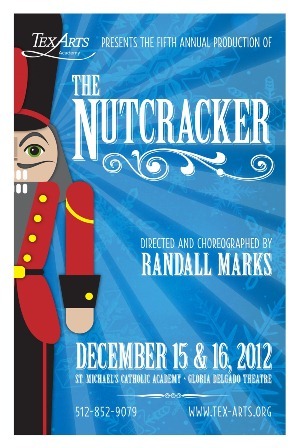 Our friends at TexARTS Youth Ballet Theatre in Lakeway present the classic story of The Nutcracker! Bring the whole family and be swept off your feet as this holiday favorite comes to life on stage! Come join a festive party, fight off the Mouse King, see the Land of Snow and watch in wonder as the Sugar Plum Fairy hosts a dazzling array of dances! Don't miss out on this once-a-year opportunity. It's the perfect holiday treat! Performances are December 15th at 2pm and 6pm and December 16th at 2pm at St. Michael's Academy. "My life would be worthless without music", says a young girl playing the violin in The Recycled Orchestra. Cateura, Paraguay is a town essentially built on top of a landfill. Garbage collectors browse the trash for sellable goods, and children are often at risk of getting involved with drugs and gangs. When orchestra director Szaran and music teacher Favio set up a music program for the kids of Cateura, they soon have more students than they have instruments. That changed when Szaran and Favio were brought something they had never seen before: a violin made out of garbage. Today, there's an entire orchestra of assembled instruments, now called The Recycled Orchestra. Landfill Harmonic | Juliana Penaranda-Loftus & Alejandra Nash from Focus Forward Films on Vimeo. Our Gift to You: $50 Gift Certificate for Only $25! Happy Hanukkah, Merry Christmas, and Happy New Year! Whatever you celebrate, here's our gift to you: $50 Gift Certificate for Only $25! 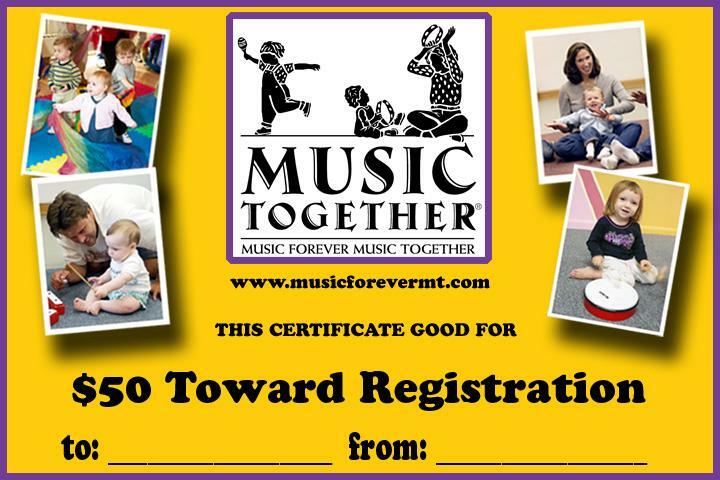 The gift certificate can be used towards registration for our 10-week 2013 Music Forever Music Together Winter Session starting the week of January 14, 2013. Click here to review our Winter Schedule. The gift certificate is transferable and thus makes for a great Hanukkah/Christmas present! Save even bigger: the gift certificate can be combined with our other promotional offers. To purchase one more gift certificates, go to Austin Mom Deals. 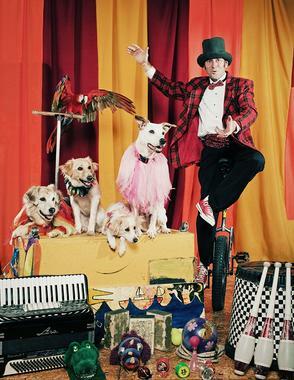 Hurry, offer ends December 23, 2012.
and a clown that was the main juggler and unicyclist on the Royal Lichtenstein Circus! (enter off of Crestwood - parking in the lot on Crestwood). Bring family and friends and blankets to sit on! In case of bad weather conditions, event takes place in the Kleberg Hall. PS: Music Forever Music Together is giving away a 50% off tuition gift certificate for classes during their upcoming Winter Session! Thank you Kristin, for your awesome guest blog post! Children can learn in every way, every day. The most powerful tool we can give them is our time, parents. There are "8 smart" areas in which children learn. One of these "smart" areas is auditory development; music, rhythems, and sounds. Encouraging this kind of learning in all children is essential. Providing them opportunities to sing, dance, listen, count beats, make rhymes, and follow musical patterns, is a cornerstone for creative auditory learning. Time is a valuable thing; make your time at home with music activities, easy and fun! 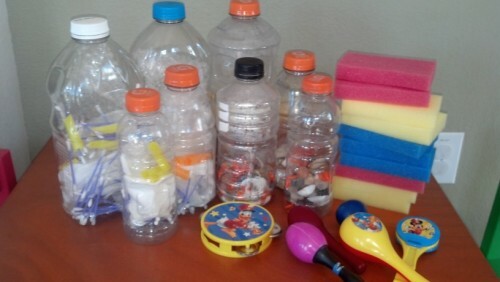 One fun and no cost way to make music instruments is using old plastic bottles; such as, juice, soda, water, and milk jugs. Make bottles that will create loud sounds, and bottles that will create quiet sounds. You can view a lesson plan here that will guide you to teach this easy concept of learning making quiet and loud sounds to your child. Add in some other real musical instruments such as shakers, rattles, horns, and drums to help teach your child how to make loud sounds. Give them some colorful sponges to squeeze, teaching the concept of "no sounds or quiet." Extend your child's learning with these by counting them, naming their colors, and making patterns or sorting them! Turn on some music. Have your child use the loud and quiet music bottles to listen to the music and make sounds that follow along with what they hear. Is it loud music? Shake the loud bottles. Is it soft, quiet music? Shake the quiet bottles. Is the music fast? Have your child shake the bottles fast. Is the music slow? Have your child shake the bottles slow. So what is music to a young child anyways? A way for them to express themselves. A way for them to have fun, singing and dancing along. A way for them to use creative imagination. A way for them to learn rythm, beats, tones, and sound patterns. YES! All of the above. Most of all, it is a form of art, portraying uniqueness in every child's ability to learn. Holiday Stop & Shop from vendors such as Stella & Dot, Isagenix, 31 Bags, Scentsy, A Pretty Shoppe, Creations by Nicole, and more. Childcare will be open for shoppers. Door Prizes (Music Forever Music Together gift certificate and other prizes). Entertainment for the little ones with Music Forever Music Together from 11am-3pm. In addition to the above, we offer free sample classes during our sample class week from January 7-11, 2013 at all of our locations. Check out our schedule and reserve your spot (required) at http://musicforevermt.com/sampleclasses.html. To celebrate the25thAnniversary of Music Together®, we are giving away 25 gift certificates at $25 each that can be used towards their 2013 Winter Session. Enter the give-away athttp://www.musicforevermt.com/giveaway.html. We hope to see you soon and good luck winning one of the gift certificates! Absolutely not. Early childhood is a period of rapid change and development and the most critical period in a child's musical growth. It has been identified in the literature as the "music babble" stage (Moog, 1976; Gordon, 1988) or primary music development (Levinowitz and Guilmartin, 1989, 1992, 1996). Even the youngest infant is wired to receive music and discriminate among differences in frequency, melody, and stimuli (Bridger, 1961; Trehub et al, 1990; Standley and Madsen, 1990; Zentner and Kagan, 1996). Just as in language development, babies are taking in information and processing it, creating new understandings of the language and experience of music that will lead to later stages of development. Both my daughter and I have just completed our first semester of Music Together and I thought you might benefit from hearing the positive impact it has already had in our lives. At home we listen to all types of music frequently and interact in various ways. When she hears songs from Music Together, she smiles at me with gleeful anticipation. This is her signal that it is special time with Mommy. I can't thank Music Together enough for providing us with such engaging and fun songs. They have come in handy for many long car trips. The interactive activities easily became car games and kept us both happy and singing for hundreds of miles. We are now involved in our second session and Rita thoroughly enjoys the classes. There is always something new to explore and to develop as she grows both musically and physically. The first session she could only physically play the egg shakers, rock, and "sing." Now she can beat the drum and play a key board using index fingers. Currently, she is working on beating sticks in time. As she gains better control of her motor skills, she will find an entire world of instruments to explore! Coming to class is fun. As soon as we enter the building my daughter becomes VERY excited. It's such a pleasure to watch her develop musically and I've also recognized my own hidden musical talents surfacing! We both eagerly await the next session! Just a friendly note to thank all those involved in this wonderful music program for children. We have been attending this class for 2 semesters and will continue for many more to come. A special thanks to my daughter's teacher, Miss Linda, who gives every child individual attention which makes each one feel special and inspired. Music Together has made the car rides a pleasure. Like most typical 23 month olds, my daughter, Valerie Lyn loves going places but hates long car rides. We turned to music to sooth and calm her. Before enrolling in Music Together we had few musical options which only appeased her for a short time. Now whether its' a trip to the mall or a visit to the grandparents, Valerie yells from her seat, "Class! Class! "...her request for the Music Together CD. The music keeps her happy for the whole trip. Thanks again Music Together for touching our daughter's life in such a wonderful way. To read more about what parents think of the Music Together program, visit http://www.musictogether.com/ParentInterviews.